We have been to Walt Disney World with the kids, three times and soon to add a fourth trip. 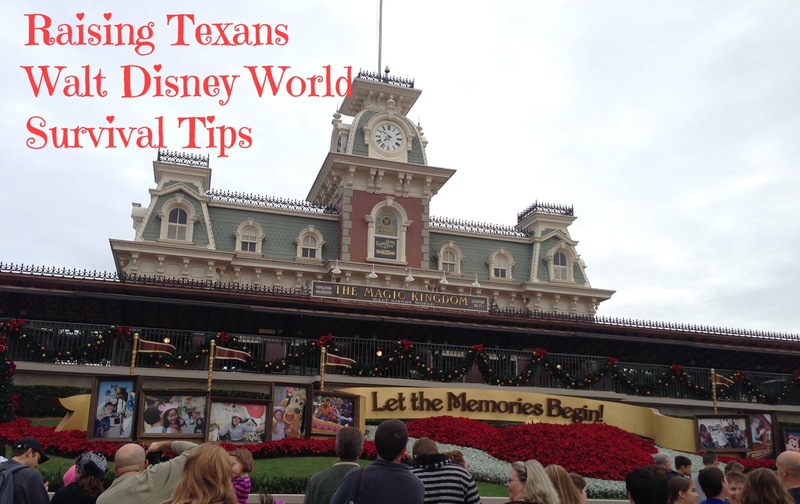 These are our tips for surviving the most magical place on earth! 1. Plan for every illness known to man. When the great stomach bug of 2013 went through our entire family while at the park, our only relief was an $8 bottle of medicine in the gift shop. Bring it with you if you have room in the suitcase. After that trip this deserves a number one priority spot! I take Tylenol, Imodium, Zantac, Allegra, Bandaids, Neosporin, anything you think you might need! 2. Antibacterial gel, see number one! 3. Mickey Fairy, I read on a blog about a mom telling her girls that Tinkerbell will bring them present if they are good. Trying to tailor it to a boy and girl, out Mickey Fairy was born! I use a Mickey Mouse paper punch to make “fairy dust” and the Mickey Fairy brings prizes every morning and some nights. Every morning there is a t shirt, small trinket, stuffed animal and fairy dust! I buy everything on sale before we get there. It helps on packing because you have tshirts packed as gifts. It helps you also not carry bags around in parks all day. I watch Walmart, Target, and the Disney Store for clothing and stuff animals, and catch everything on sale. The Dollar Tree and Target Dollar Spot are the best for small trinkets! I get autograph books and little toys, when you start really looking for Disney stuff there is a ton at Dollar Tree! The Mickey Fairy keeps us from buying stuff during the day, not saying we don’t ever but the $24.95 t shirt at the park not as cool as the $4 shirt the Mickey Fairy brought! When flying you will have to be a little more strategic, but books are also good and they lie flat. More on this next week! 4. Rent a good stroller, you will walk more than ever, and kids are heavy. Rent one from a stroller company, that delivers to your hotel. The double strollers are big, you will feel like you need a wide load sign, but they are good durable strollers that have sunshades, storage, and recline. The ones at the park, cannot leave the park and they are the plastic kind like at the zoo. I like the big strollers better. Bring luggage tag and ribbon. We put a big huge bow to make out stroller standout among the masses. 5. Bring layers and ponchos. My March attire was capris, a tshirt and a sweatshirt jacket, mid day sometimes called for shirtsleeves and ponchos. We stock up on the cheap disposable ponchos before we go, throw them on and keep going, then toss them. You will want layers, cool, warm, hot, back cool again at night. And bring extra clothes into the park. Use gallon size ziplock back, pack extra clothes. You don’t want to have to go back to the room. The bag can then store your dirty clothes. 6. Get a good backpack. While the stroller has storage, you will only want to leave stuff in it that you want a million other people to have access to. We have never had a problem with our stroller but we don’t give anyone a chance either. The backpack is our essential thing for the parks, we have extra clothes, ID, wallet tickets, cell phones, back up charger, medicine, and snacks. You have to be strategic because you don’t want to have to go back to the room, you don’t want to have to buy something you forgot, but you have to lug it around all day. We invested, not much about $20, in a hunting type outdoor style backpack from Academy. It very padded shoulders and pockets everywhere.